Sire Staked and Breeders Crown nominated! - The Big Dog p 1.49.3 $830,011. He is very closely matched to the sire and $1,840,681 winner Royal Mattjesty. Both are sons of Matts Scooter and have the No Nukes/Albatross cross on the mother's side at the second and third dams. At 2 Soul Of The Matter was a winner of his elimination and final of the Battle of Freehold in 1.55.4h. At 3 he was an individual and open winner setting an all age track record at Plainridge 1.53f. He was 3rd behind Blissfull Hall in the Cane Pace timed in 1.52.3 on a half mile track. He was timed in 1.50.3 during his 3 year old year and timed in 1.50.2 at 4. Matt's Scooter is a bay pacing ridgeling by Direct Scooter out of Ellens Glory by Meadow Skipper. He was born in 1985. He competed as a pacer in harness racing, winning the Meadowlands Pace, Prix d'Été, Confederation Cup, Messenger Stakes, American National Stakes, Breeders Crown, Driscoll Series, and Mohawk Gold Cup. He was trained by Harry Poulton. As a three-year-old he paced a mile in 1:48.2 at the Red Mile in Lexington, Kentucky, lowering the world record, previously held by Niatross, by four-fifths of a second. 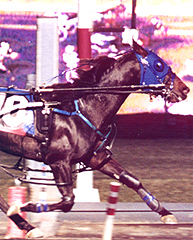 He retired after a 4 year old season in which he earned harness horse of the year acclaim. Soul Of The Matter is from a very strong maternal family full of high earning and fast winners including: Hop Sing P5 1:48.3 $931,605, So Fresh P3 1:50.3 $803,794, Armbro Warranty P3 1:50.3 $698,438, Dex The Balls P2 1:54 $625,851, Washington VC P 1:52.6 $560,984, Bono Bests P4 1:49.3 $519,660, Viking Terror P8 1:51.4 $399,283, Jordans Planet P8 1:50.3 $362,267, Pacific Challenger P5 1:53.2h $308,213, Ask A Lawyer P4 1:52.3 $261,429 and many more. FREEHOLD, N.J. (AP) _ Soulofthematter beat Old Buzzard by 2 3/4 lengths Saturday in the $150,587 final of the Battle of Freehold, a Grand Circuit event for 2-year-old pacers at Freehold Raceway. Soulofthematter, driven by Ross Wolfenden, covered a mile in 1:55.4, and paid $14.80 to win. The son of Matt's Scooter has four victories this year with career earnings of $114,918.